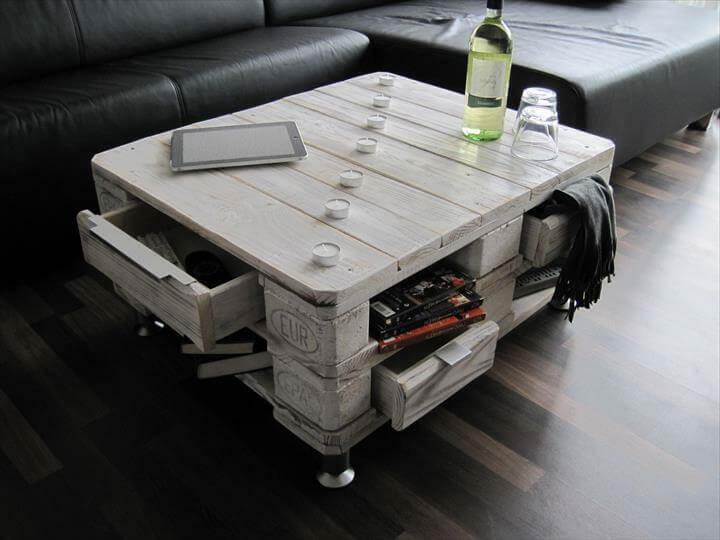 Believe us, it does take longer to get a perfect table out of pallets! Not just a utility table, you can personal features for a functional boost to your pallet products by just giving some extra wings to your creativity! 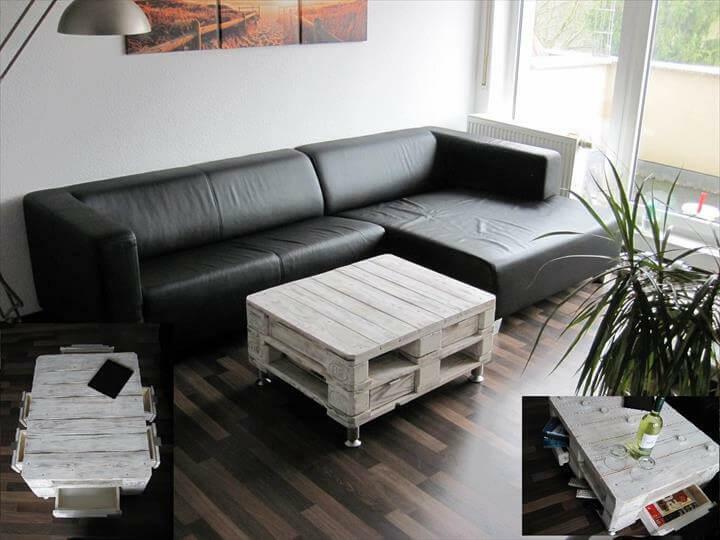 This cutest and functional DIY pallet storage-friendly coffee table is really a big matchless example of pallet furniture personalization! Underside has been modified so creatively that there are 6 drawers present just below the top to give your plenty of storage options! The shabby chic or vintage inspired appearance, rustic elegance, a damn beautiful top level for beverage and snack serving and a great impact of 6 storage drawers just turn it into a most functional piece of furniture which can really entertain us very well in our living room! 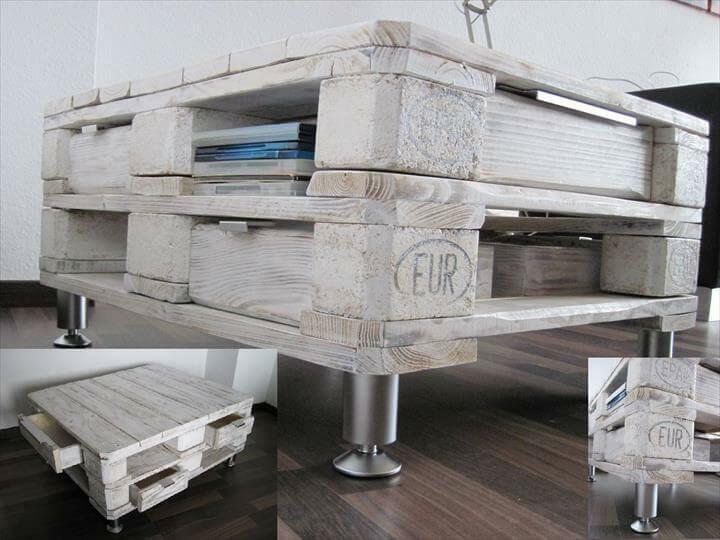 This pretty beautiful DIY pallet table can also be changed into an entertainment center or a media console table easily just make it hold a display screen over its top and let the drawers store you media items! You can see a diagonal row of tea lights which can create an overwhelming soft light glow at night, really enjoyable kind of table! Install 2 of sturdier Euro pallet boards in top to bottom arrangement and finish the setup with short hardware metal legs and that’s it, enjoy a functional table design! Table has been painted in white to look, distressed, shabby chic and vintage inspired so you will find it compatible to each of your rustic or modern living environment for sure even for the cozier living room interior! Addition of drawers makes the table storage-friendly and also brings it into prominence! Metal touch from legs accents the entire rustic nature of wood and has great impact on overall beauty of the table!